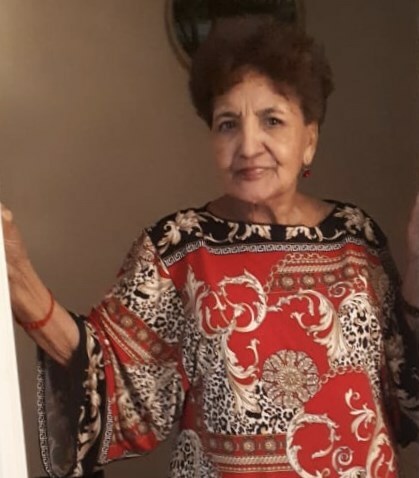 Mrs. Doraldina Lara De Lara of Tifton formerly of Guatemala City, Guatemala passed away at her daughter’s residence, on Sunday, September 9, 2018. A memorial service will be held at 7:00 P.M. on Thursday, September 13, 2018 at the Chapel of Albritton Funeral Directors with Father Alfonso Gutierrez officiating. A private interment will be held in Guatemala. Mrs. Lara De Lara was born June 30, 1933 in Guatemala City, Guatemala to the Jose Gustavo Lara and Josefina Cardenas. In addition to her parents, she was preceded in death by her husband, Isaac Lara; her brother, Jaime Lara; two sisters, Emilse Lara and Nereida Lara; her grandson Luis Fernando Avalos. Mrs. Lara De Lara was a member of Our Divine Savior Catholic Church and a homemaker. She had lived in Tifton for twelve years and was active in her church. She loved her family and enjoyed cooking for them. She was always ready to help those in need and was a true Christian. Mrs. Lara De Lara was a dedicated grandmother and great grandmother. Mrs. Lara De Lara is survived by three daughters, Dina L Willis of Tifton, Heidy Y. Lara of Beaufort, South Carolina, Ligia J. Lara of Guatemala; one son, Isaac and Martha Lara of Hesperia, Calif.; grandchildren, Erick R. and Olga Garcia-Salas, Alejandro J. and Claudia Garcia-Salas, G. Koby Willis, Charles Isaac Willis, Leslee Anahi and Pedro Sanchez of Guatemala, Ligia Adriana Ramirez, Janice Lara and Karina Lara; great grandchildren, Sebastian Sanchez, Adriana Sanchez, Sebastian Garcia-Salas, Simon Garcia-Salas and Noah Garcia-Salas; two sisters, Yolanda Warren and Elsa Lara of California. In lieu of flowers, you may make donations to Our Divine Savior Catholic Church, P.O. Box 212, Tifton, Ga. 31793 or Immaculate Conception Catholic Church 1132 2nd Street, Moultrie, Georgia 31768.